Ant-Man & The Wasp is like its star, Paul Rudd: pleasant, affable, non-threatening. It's also forgettable, something I cannot say about Rudd but that I can say about most of his oeuvre. Ant-Man & The Wasp may be a good respite from the 'intensity' of Avengers: Infinity War, which is nice. However, the best and worst I can say about Ant-Man & The Wasp is that it's 'OK', nothing more, nothing less. 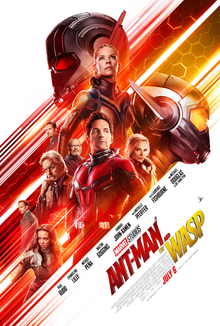 With only days to go before his house arrest is lifted, Scott Lang (Rudd) has a strange dream, one that he contacts Dr. Hank Pym (Michael Douglas) about. Pym and his daughter Hope van Dyne (Evangeline Lilly) realize it involves Hope's mother/Hank's wife Janet (Michelle Pfieffer). She as 'The Wasp' shrunk to subatomic levels and was lost in that universe, but it seems that perhaps she is alive, having subconsciously contacted Lang when he shrunk to that level not that long ago. Despite his fear of being found to have violated his house arrest and working feverishly to avoid FBI Agent Jimmy Woo (Randall Park) from finding out, Scott finds himself roped into Hank & Hope's efforts to find Janet. These efforts involve them dealing with black marketeer Sonny Burch (Walter Goggins) for material they need for something or other. Sonny knows that whatever the Pyms are working on will lead to much more money, so he makes himself a nuisance while Hope, as the new Wasp, faces a new enemy: a Ghost who also wants the Pym Lab that can shrink. Hank, against his will, is cajoled into contacting his former partner Dr. Bill Foster (Laurence Fishburne), who gives him some tips and then is found to be in cahoots with this 'Ghost'. Ghost, who has the ability to travel through objects and appear to move quickly while disappearing and reappearing, is really Ava (Hannah John-Kamen), who as a child survived a similar experiment that Hank is developing but which went wrong, causing her molecular structure to be unbalanced. Ava/Ghost believes that Janet is the key to restoring her, but that would mean tearing Janet apart, something Hank refuses to do. Bill thinks he can control that, but even he is horrified that Ava would threaten Scott's daughter, telling her that if Ava harms one hair of Cassie (Abby Ryder Fortson), he will not help her. Into all this is X-Con, the security firm headed up by Luis (Michael Peña) and his associates Dave (T.I. 'Tip' Harris) and Kurt (David Dastmalchian). The rest of Ant-Man & The Wasp becomes a perpetual chase: both Ghost and Burch are after the lab, Scott as Ant-Man with Pym and The Wasp trying to play a game of keep-away while Woo just keeps trying to prove Lang is violating his house arrest and keeps getting foiled every time. Ultimately, the X-Con crew uses 'truth serum' to stop Burch and his minions, Janet is rescued from her subatomic universe, Ghost is restored, Lang is released from house arrest...and then Hank, Hope and Janet are turned to dust while Scott is stuck in the subatomic universe. I remember really enjoying Ant-Man for its strong mix of comedy and action, a comic book adaptation that didn't take itself seriously while still keeping to the standard origin story. Ant-Man & The Wasp, I think, tried to recreate that feel, and that's where the problems set in. It seemed like Ant-Man & The Wasp was on autopilot, repeating everything that had come before and worse, being so obvious about it. The thing about comedy is that it is deadly to try and oversell it, to tell your audience, 'look how funny we are'. That, however, is exactly what happens in Ant-Man & The Wasp. Take the scene where Burch is interrogating the X-Cons with 'truth serum'. Luis, Dave and Kurt all go on about how it's 'truth serum' despite the villains insisting there is no such thing as 'truth serum'. While Luis' rambling stories, down to mentioning a restaurant that plays only Morrissey songs because 'Chicanos like Moz' is amusing, the rest of that sequence is so forced. Over and over Ant-Man & The Wasp is so conscious of how it's trying to be funny that it ultimately ends up not being funny but forced. Ant-Man & The Wasp also suffers from a bad sense of a lack of a threat. Ghost is not an actual villain since her motives are not evil. Sonny Burch and his crew just seem to be there to provide more obstacles rather than be actual threats. Woo is just there. I don't think there was a genuine antagonist in the film. I also pause at this juncture to wonder, if Janet is wandering around in this subatomic universe for thirty years, how did she manage to live apparently without eating or doing anything else? Am I being too hung up on details again? The performances were acceptable but nothing special. Rudd is his likable self, ready with a quip, though he has a nice moment when Janet channels him and he behaves more feminine towards Hope and Hank. Lilly is strong in the action scenes, but there seems to be little to suggest in either her or Rudd's performance that Hope and Scott were lovers, let alone actually interested. It's nice to see Pfieffer and Douglas working together, and they were good but again nothing that challenged either. Fishburne must be happy to be part of the Marvel Cinematic Universe, and John-Karem did OK but again was not memorable as Ghost. Goggins was neither campy enough or serious enough as Sonny Burch to where he was superfluous. The X-Cons similarly weren't as good as the last time, and both Judy Greer's Maggie (Scott's ex) and Bobby Cannavale's Paxton (her new husband) simply weren't needed. Park seemed perfectly conscious that he was more 'comic relief', but his Agent Woo came across as more Inspector Closeau than Fox Mulder. Everything in Ant-Man & The Wasp was acceptable (save perhaps for the ending, which while tying it in to the overall Marvel Cinematic Universe seems a bit unfair to Janet: she finally being brought back to life only to be turned to ash shortly afterwards). I've no complaints about the film. I also have no great enthusiasm for it either.